Dom Starsia guides the men’s lacrosse team to the NCAA championship, and football coach Mike London leads the Cavaliers to the Chick-fil-A Bowl. Starsia and London received national and conference coaching awards for their seasons. 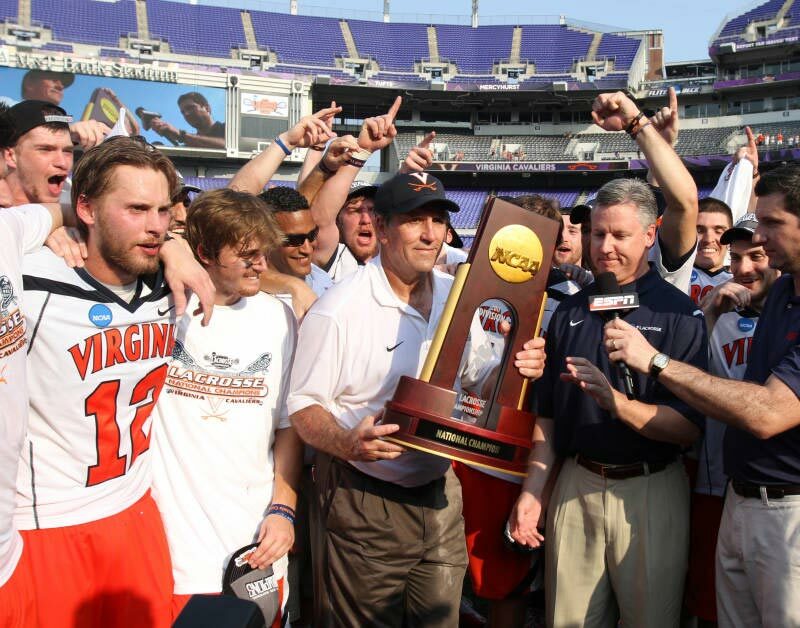 In the course of leading the Cavaliers to the national title with a 9-7 victory over Maryland, Starsia recorded 329 career victories, the most of any coach at the Division I level. The effort on the field was led by Steele Stanwick (Col ’12), winner of the Tewaaraton Trophy, awarded to the top male collegiate lacrosse player in the country. In football, the Cavaliers compiled an 8-4 regular season record and will meet Auburn on New Year’s Eve in Atlanta for the Chick-fil-A Bowl. London, in his second season, was named ACC Coach of the Year. The Class of 2015 not only weighs in as the largest in University history with more than 3,434 students, but the group also boasts the most impressive academic credentials. As enrollment increases at the University, the bar also seems to go up academically. In this year’s entering class, 91 percent of students finished in the top 10 percent of their graduating classes, and their average combined math and verbal scores on the SAT was 1,339 points. That’s up eight points from the scores posted by last year’s group. Four entering students achieved perfect scores on all three portions of the SAT—math, verbal and writing—and 22 posted perfect scores on the math and verbal sections. With the addition of Michael Strine as executive vice president and chief operation officer and John Simon as executive vice president and provost, President Teresa Sullivan completes the University’s new leadership team. Sullivan’s announcement in August of Simon’s appointment signaled a new phase in the University’s administrative evolution. The leaders quickly began implementing a new internal financial model to increase transparency and give individual academic units incentives to become more efficient while developing new programs. 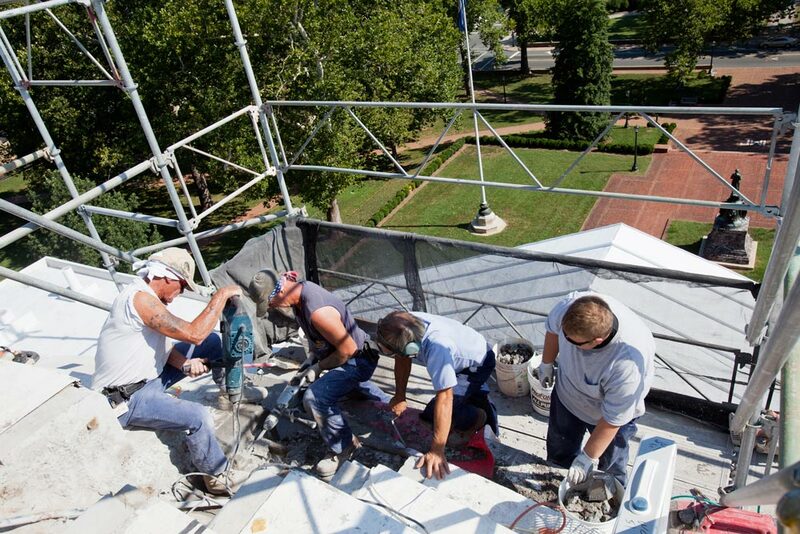 After an extensive evaluation, officials decide to repair—not replace—the leaky Rotunda roof, which was last renovated in the 1970s. The good news: The Rotunda roof is structurally sound. The bad news: It’s been leaking for years and has gotten progressively worse. That’s what David Neuman, architect for the University, told the Board of Visitors in September. Look for repairs to begin by March. And don’t fret about changes in appearance. Neuman said the roof will look much like it does now, though it may be repainted a slightly duller shade of white. That will match its appearance in 1976, when the Rotunda was last restored. As the fire of 1895 showed, the Rotunda is not immune to disaster, yet the icon of the Academical Village escaped damage when an August earthquake struck. 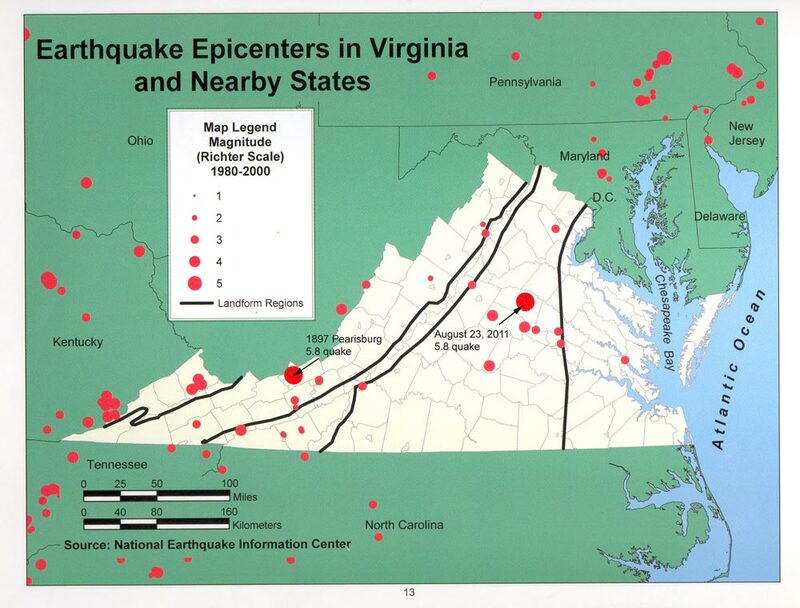 The rattling and shaking drew many comparisons—to a giant jackhammer, to a train—but the 5.8 scale earthquake that hit on the first day of classes left many people at a loss for words. The prospect of damage to any part of the Academical Village, a World Heritage Site, sent tremors through the UVA community. Initial anxieties proved unfounded, though, when Don Sundgren, UVA’s chief facilities officer, reported minimal damage. The University retains its rankings as No. 2 public university and one of the best values in higher education, while several academic programs rise by leaps and bounds. Holding steady may not always be the most ambitious of goals. But when budgets are tight and state support is shrinking, ground not lost is ground gained. 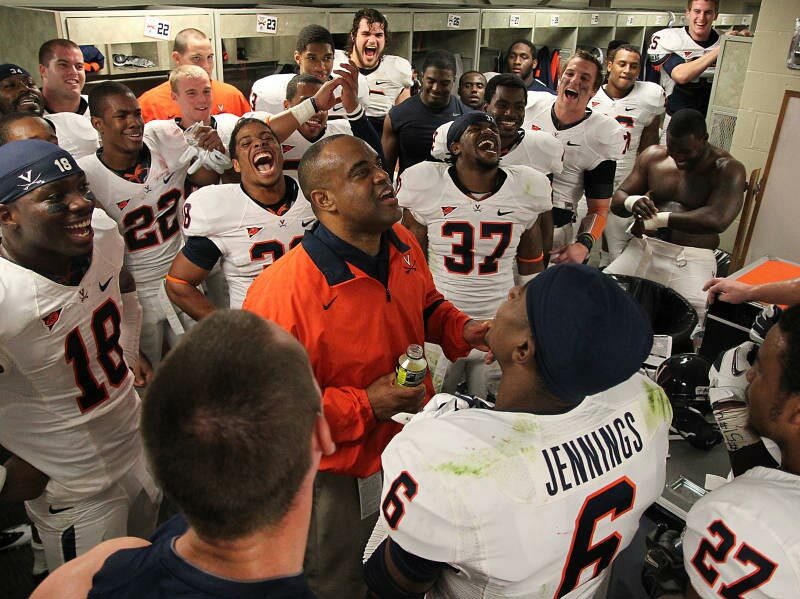 To that end, UVA held steady in two important rankings—the No. 2 spot among public universities and No. 1 among “best value” public colleges and universities. The two send a powerful message. “[It says] that we deliver a great education at a fraction of the cost of other schools and we do a good job of managing our resources,” says President Teresa Sullivan. That ranking was in U.S. News & World Report, which also placed the UVA Medical School at No. 19 in teaching primary care (up 19 places). The Darden School was named No. 3 in Entrepreneurship by Princeton Review and No. 4 among MBA programs in the world by The Economist. Will Roberts dominates on the mound for the Cavaliers. 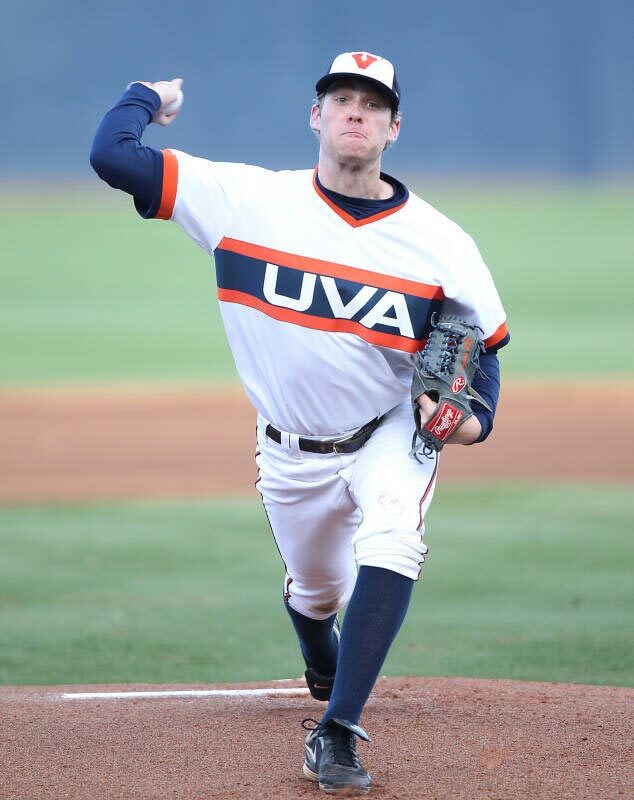 Will Roberts pitches the first perfect game in UVA baseball history, and Joanne Boyle sets a blistering pace as new women’s head basketball coach. With 98 pitches on a sunny day in late March, Roberts earned a place in collegiate baseball history. His perfect game—27 straight outs over nine innings with no runners reaching base—was the eighth in NCAA Division I history, the second in the ACC and a first for the Cavaliers. The 2-0 win over George Washington also helped pave the way for UVA’s second trip ever to the College World Series. In basketball, Boyle led the Cavaliers to eight wins in the team’s first 10 games. The fast start included a 69-64 overtime win against No. 3 Tennessee. Boyle was named head coach of the women’s program after Debbie Ryan, who led UVA teams for 34 years, stepped down in March. 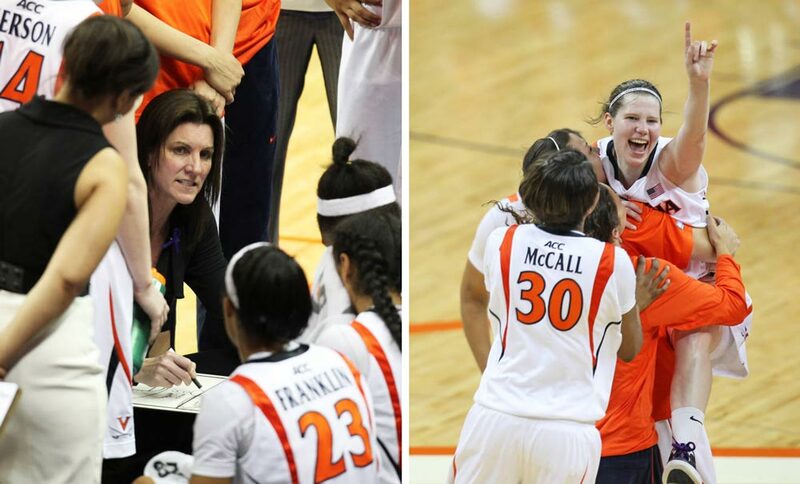 Women’s basketball coach Joanne Boyle (left photo, center). 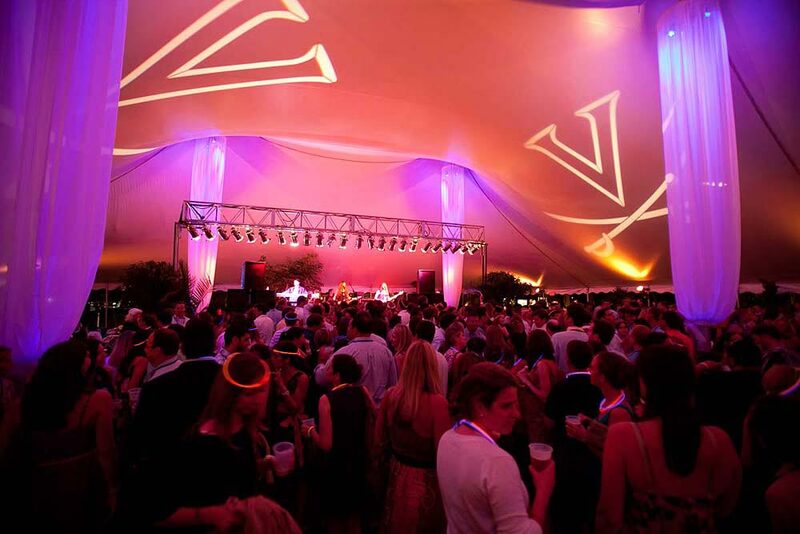 Despite hard times in the economy, the University’s endowment ends the 2011 fiscal year with double-digit growth, and gifts to the UVA campaign take a turn for the better as well. At a time when pitfalls and potholes dominated the financial outlook, the University of Virginia Investment Management Company (UVIMCO) found solid footing on its path to growth. 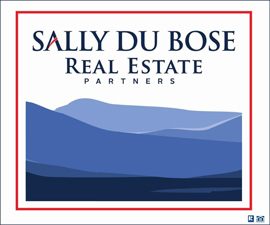 By the end of the fiscal year in June, the return for the long-term investment pool stood at 24.3 percent, up significantly from the 15.1 percent increase the previous year. “We’re back!” Larry Kochard (Grad ’96, ’99), CEO of UVIMCO, told members of the Board of Visitors early this year. UVA’s endowment, like others around the country, suffered from the Great Recession. Its value dropped from $5.1 billion to $3.9 billion in a single year. At the end of Oct. 2011, the endowment totaled $5.35 billion. On another front, the Campaign for the University showed steady progress. The most recent total (Oct. 31) stood at $2.52 billion, and overall giving by alumni, parents and friends was up 35 percent for the fiscal year. The doors open at the Emily Couric Clinical Cancer Center (as well as the Engineering School’s Rice Hall, the Hunter Smith Band Building and the renovated Garrett Hall, new home of the Batten School). 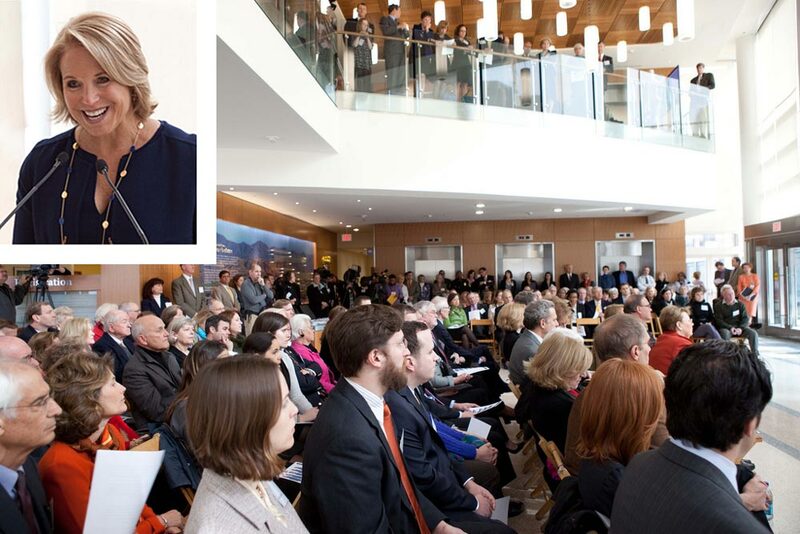 In one sense, the dedication of the Emily Couric cancer center in February was a family affair. Katie Couric (Col ’79), renowned broadcast journalist, was on hand to invoke the memory of her sister, Emily, who died of pancreatic cancer in 2001. Patients began receiving treatment at the $74 million facility in April. This fall, University leaders gathered to dedicate the Hunter Smith Band Building (which gives the Cavalier Marching Band a permanent home), the Engineering School’s Rice Hall and Garrett Hall, which was renovated to serve the Batten School of Leadership and Public Policy. 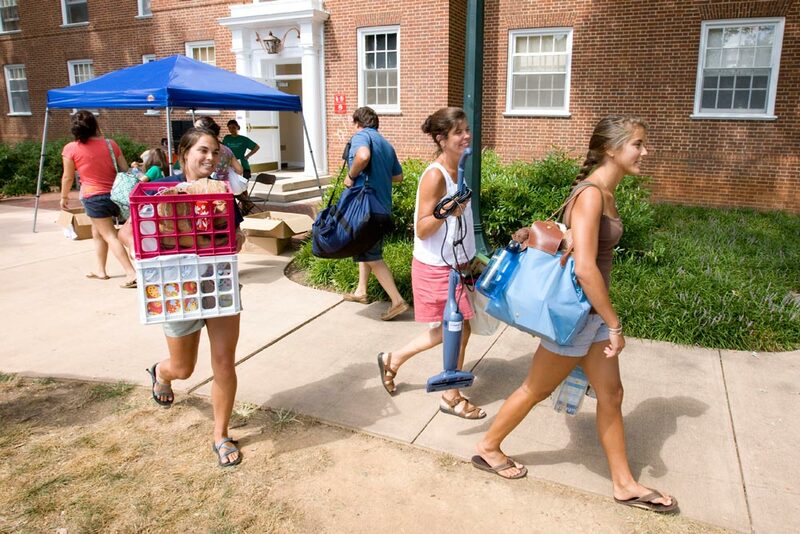 A record number of alumni return for Reunions Weekend, and people flock to other special events, including one celebrating the 40th anniversary of full coeducation. For Julie Choe Kim, (Col ’96), it was a chance to “indoctrinate” her children. 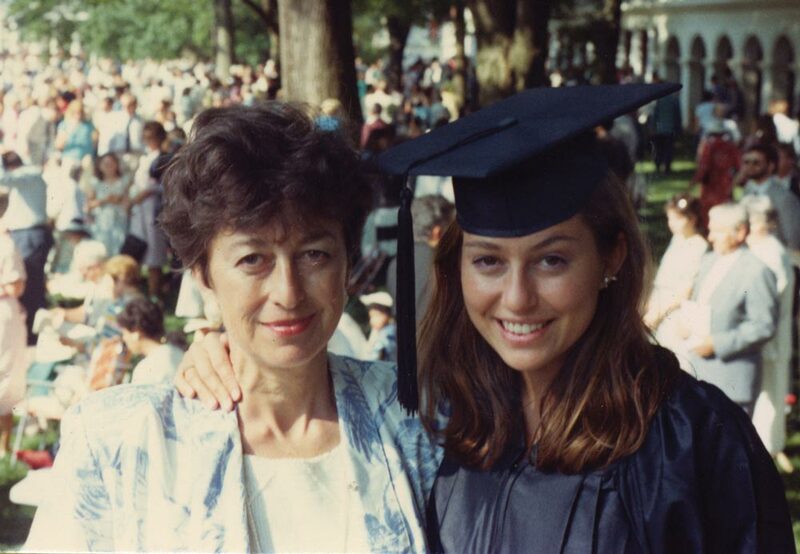 Alexandra Arriaga (Col ‘72) at her graduation with her mother. Arriaga was a speaker at the March event and received the 2011 Distinguished Alumna Award. Read more about her here. And Catherine Ruedig Hunter (Col ’01) simply followed her taste buds. “I needed a fix of a side of house dressing,” she said, referring to a spread used at Take It Away, a sandwich shop on the Corner. For whatever reason, Reunions in June drew the most participants ever—3,003 registered alumni and an additional 1,500 family members and friends. In March, numerous alumnae returned to Grounds to remember and celebrate the moment in 1970 when 450 women enrolled in the College of Arts & Sciences, marking the University’s transformation into a fully coeducational institution. We asked students on the street: what's the best thing about 2011? Students on the Street: What's the Best Thing About 2011? from UVA Magazine on Vimeo. These are only a few of the many moments that made 2011 a great year at UVA. Have we missed your favorite headline from the past year? Let us know your top 2011 stories in the comments below!